Who Knew It Was This Easy To Make Homemade Alfredo Sauce?! 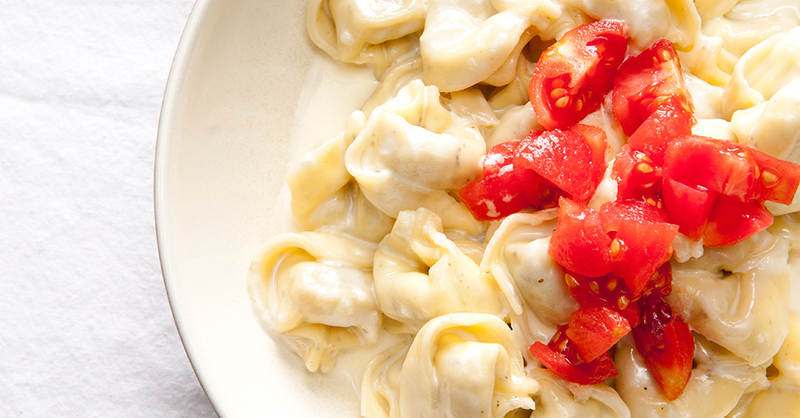 When it comes to weeknight dinners, tortellini alfredo is a cheesy, creamy favorite that packs plenty of flavor. We used to think it was complicated to make, but then we realized that you only need a handful of ingredients and a couple minutes to make an amazing alfredo sauce, making this the perfect meal to prepare for your family after a long day. This silky, homemade sauce requires only five ingredients (you can spruce it up with some add-ons though), but it turns frozen pasta into a gourmet experience. Top it off with grated parmesan cheese and diced tomatoes, and you’ve got yourself a delicious meal that’s sure to please! Bring a large pot of salted water to boil and cook pasta according to package directions. While pasta is cooking, melt butter in a medium saucepan over low heat. Add heavy cream and stir constantly until heated through. Remove sauce from heat. Add parmesan cheese, reserving 1/4 cup for garnish. Add nutmeg, then season sauce with salt and pepper. Remove pasta from boiling water and drain. Top with alfredo sauce, diced tomatoes, if using, and extra parmesan cheese.